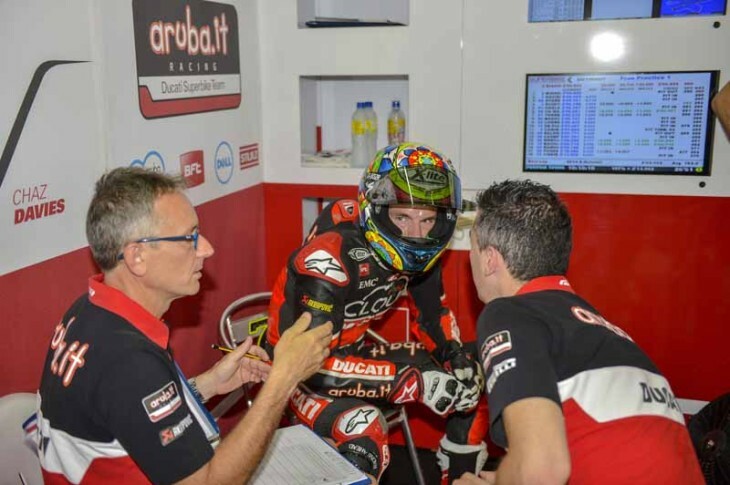 Sepang (Malaysia), Friday 31 July 2015 – The Aruba.it Racing – Ducati Superbike Team and rider Chaz Davies, on track for the first sessions at the Sepang International Circuit in Malaysia, concluded day one of this tenth round of the 2015 World Superbikes in second position. Fairly warm and sunny conditions for the first timed practice session with a track temperature of 35°C. Davies was lapping well right from the start, recording times that immediately positioned him at the top of the timesheets. His best lap, completed in 2’04.972 saw him conclude this opening session in second place. In the subsequent session a wet track, due to heavy rain prior to the practice, prevented all SBK riders from improving on their lap times. Having spent most of the session in the garage, Davies made an exit in the final phase, setting the fastest lap of this semi-dry session. Davies thus closed this first day of action in second position overall. Tomorrow he will return to the track for the final timed practice and the all-important Superpole.